Josh Gilbert's movie about the 2003 prosecution of Tommy Chong for the interstate sale of drug paraphernalia, a/k/a Tommy Chong, points out the ridiculous nature of the witch hunt against the taller half of Cheech and Chong. It all comes down to an ideological culture war waged by the dogmatically conservative Justice Department under Attorney General John Ashcroft. More than Ashcroft, though, it was the U.S. Attorney for the Western District of Pennsylvania, Mary Beth Buchanan, that waged this particular battle. Originally appointed to that position just a week before the 9/11 attacks in 2001, she also held a concurrent position between 2004 and 2005 as director of the Executive Office of U.S. Attorneys, putting her in charge of all 94 of her colleagues around the nation. The prosecution of Chong will be forever wedded to Buchanan's career for several reasons. Chong's case was controversial before it came to pressing charges or sentencing. The methodology used by Buchanan in the drug paraphernalia sting called Operation Pipe Dreams goes beyond the use of unnecessary force and brushes closely with entrapment. It is against the law to ship drug paraphernalia across state lines in two states, and luckily for Buchanan, Pennsylvania is one of them. According to a manager at Chong's Glass/Nice Dreams, a man from Beaver Falls, PA called at least 20 times, trying to get them to send him a large order of their handmade glassware. Staff at the company refused every time, citing the law against selling paraphernalia in that state. The Beaver Falls man became so frustrated that he finally traveled to their headquarters in California and put together an order on site. By the time the company had amassed and packaged everything the man wanted, he told them he was back in Pennsylvania; could they just ship it to him? At first they said no, but as the boxes held up production for other orders, they finally caved and sent the stuff out. Then, the feds had what they needed. They "storm trooped" the place, as one employee of the shop put it. Dozens of agents overtook the place in the early hours of the morning, all decked out in riot gear. Paris Chong, Tommy's eldest son and the CEO of the glass-making company, said that from the very beginning it was obvious why they were there, and it had little to do with him or his company. "It was about my father and his celebrity," he said. Buchanan convinced Tommy Chong to take the fall, even though he was clearly only a financier for the company and had very little to do with the illegal shipment or any day-to-day operations, so that Paris Chong and his mother could avoid charges. In fact, it seems the whole of Operation Pipe Dreams was about Chong. Despite the eerie similarity to the name of his glass-blowing business (and one of the more famous Cheech and Chong movies), he was also the only defendant with no priors to serve time. Of the 55 charged in the entire operation, he served the most time: nine months in federal prison. There are indications that the Justice Department wanted to punish Chong for the counter-culture movies about drug use made with fellow comedian Cheech Marin. It also seems that the long sentence was a way to punish Chong for speaking to the media about his case. The fact that the Justice Department spent $12 million to put Chong in jail didn't go unnoticed. In fact, it seems to be the consensus that the case only served to increase the celebrity of Chong and animosity against the authorities. Chong says going to jail made him into "an activist" when he saw all of the harm caused by what he sees as an unfair criminal justice system. He‘s also concerned about the absurdity of the War on Drugs when we have a much more pressing -- and wholly unrelated -- war on terrorism to worry about. There's speculation that Buchanan may rise even higher, possibly by heading to Washington or running for office herself some day... A Buchanan campaign could boast high-profile prosecutions and non-profit admirers, and political-gossip Web sites have even mentioned her as a potential Republican gubernatorial candidate. Besides that, it's not a foregone conclusion that she'll even leave her current post. It's common practice for U.S. attorneys of any party to automatically offer their resignations when a new president assumes office. But Buchanan has other ideas. She told the Pittsburgh Post-Gazette she wants to stay on. The prosecution of Tommy Chong seems so egregious and ridiculous that it cries out to have a higher profile in the media. The drug war has been a failure for as long as it has been in effect, with the waste of millions of dollars and broken lives of the prosecuted. People have hundreds of choices they make every day, some harmful to themselves, some not. Why not allow someone to make a choice about their own consciousness? 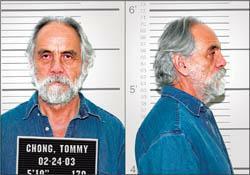 Tommy Chong not only did nothing wrong, but certainly didn't do anything to deserve being caged like an animal. The real criminals in this situation are simply those in power, who violated Tommy's life, liberty and property. This is not the proper role of Government; governments were instituted among men to protect our liberties, not take them away. This also was clearly entrapment, coupled with malicious lies with the intention fabricating a situation in order to prosecute an innocent man. This is a truly terrible and dirty deed, lying and deceiving in order to entrap the innocent and harmless. It angers me, as it should anger any decent human being. I thought that I would post a few passages of scripture that I think speak for themselves and clearly shed some light on what really happened here. Yea, he saith unto them: Deceive and lie in wait to catch, that ye may destroy; behold, this is no harm. And thus he flattereth them, and telleth them that it is no sin to lie that they may catch a man in a lie, that they may destroy him.